I’m always on the lookout for mouthwatering ways to include pistachios into cuisine. They’re such a delightful culinary nut. My most recent pick: pesto mayo! Even just saying those two words makes my mouth water. But I’ll admit I have a bit of a guilt factor when I’m enjoying a sandwich with the extra-luscious spread because I know it’s extra caloric. So off to the kitchen to whip up a better-for-me—and better-for-you—sandwich spread. But this new recipe goes beyond simply being a delectable match for a sandwich. It’s tasty as an inspired pistachio “hummus” paired with cherry tomatoes, sweet bell pepper strips, or practically any seasonal veggie. I love it when a recipe can multitask! Serve it up at your next picnic or cookout alongside ketchup and mustard (it’s a terrific topper for veggie or poultry burgers) and as your dip of choice. Disclosure Note: At time of posting, Jackie Newgent, RDN, CDN worked with Wonderful Pistachios to help people make healthier snack choices. Add all ingredients to a high-powered blender or food processor. Cover and puree until velvety smooth, about 3 minutes. If necessary, add green tea by the teaspoon for a thinner consistency. Adjust seasoning. Cover and chill until ready to serve. 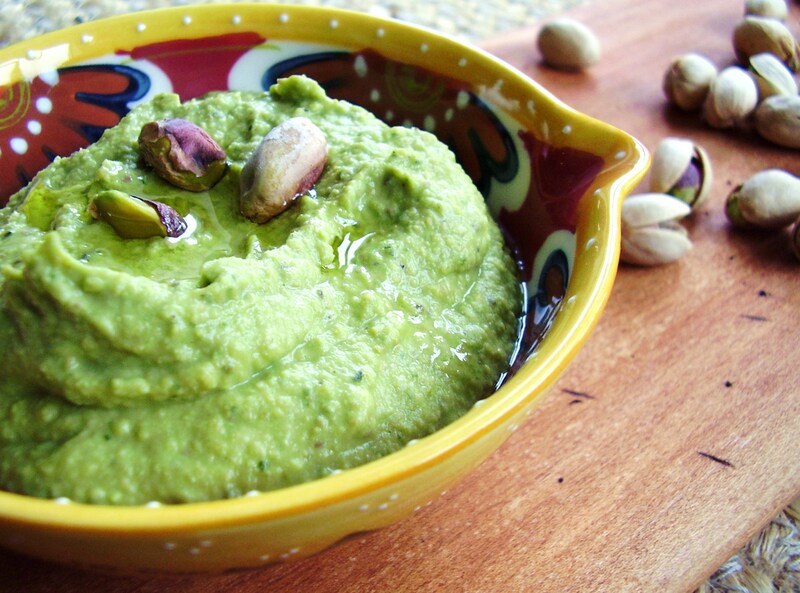 Add the basil, pine nuts, garlic, salt, and pepper to a food processor or blender and puree. With the machine running, add the oil through the feed tube and process until the basil mixture is smooth. Add the cheese and pulse to evenly combine. Add the mayonnaise and pulse to evenly combine.